After graduating high school in Southern California in 1976, Eric went on to study at the Berklee College of Music in Boston, Mass. There he studied with the legendary saxophone professor, Joe Viola. By the time he left Berklee, Eric had achieved the highest proficiency rating given by the school. In 1995, Eric was awarded the Berklee Distinguished Alumnus Award for outstanding achievements in contemporary music. He has since gone on to perform in over 65 different countries, recorded 11 solo CD's and has played on hundreds of records, films, television shows and commercial jingles. Eric started his professional career in 1980 with famed New Orleans trumpeter Al Hurt. After returning to Los Angeles Eric became a member of the Chick Corea Elektric Band. He recorded 6 CD's with Chick's band and 2 of those CD's were Grammy award winners. Eric went on to perform with artists such as Elton John, Barbara Streisand, Billy Joel, Stevie Wonder, Dionne Warwick, Burt Bacharach, Aaron Neville, Johnny Mathis, Dave Grusin, Lee Ritenour, David Benoit, The Rippingtons, The Gordon Goodwin Big Phat Band, Patti Austin, Lou Rawls, David Lee Roth, The Yellowjackets, B.B. King, Ramsey Louis, Patti Labelle, Olivia Newton-John, and many others. Among Eric's 11 solo CD's, his latest is entitled "Got You Covered", on Peak Records. Six of the songs that Eric has recorded have made it to the top 10 of the National Contemporary Jazz Radio Charts and two have made it to #1. Eric's "Oasis" CD hit the top 5 on the Billboard Contemporary Jazz Chart. Shortly after that, Eric was voted as being one of the year's "Favorite Alto Sax Players" in Jazziz Magazine's Reader's Poll along with David Sanborn and Phil Woods. 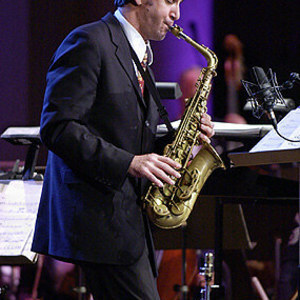 Eric has also written 3 instructional books, "Comprehensive Jazz Studies & Exercises", The Ultimate Jazz Play Along" and "The Music Of Eric Marienthal" as well as 3 instructional videos, "Play Sax From Day One", "Modern Sax" and "Tricks Of The Trade", all published by Warner Bros. Publications which is now Alfred Publishing/Belwin Jazz. Every summer for the past 8 years Eric has put on an annual fund raising concert for High Hopes, a non-profit organization in Orange County, California that works with people who have suffered traumatic head injuries. With the help of many guest artists who have donated their time to perform, these concerts to date have raise well over a half million dollars for this charity. Andi or Valerie can be reached at 310-385-4135 or e-mail at AHowardEnt@aol.com. Please visit Eric's web site at www.ericmarienthal.com.